Surveyed between 2000 and 2007 (National Trust: Geoffrey Brown and Dave Stewart). Location: OS map reference: ST 964 030. Nearest town/village: Shapwick. 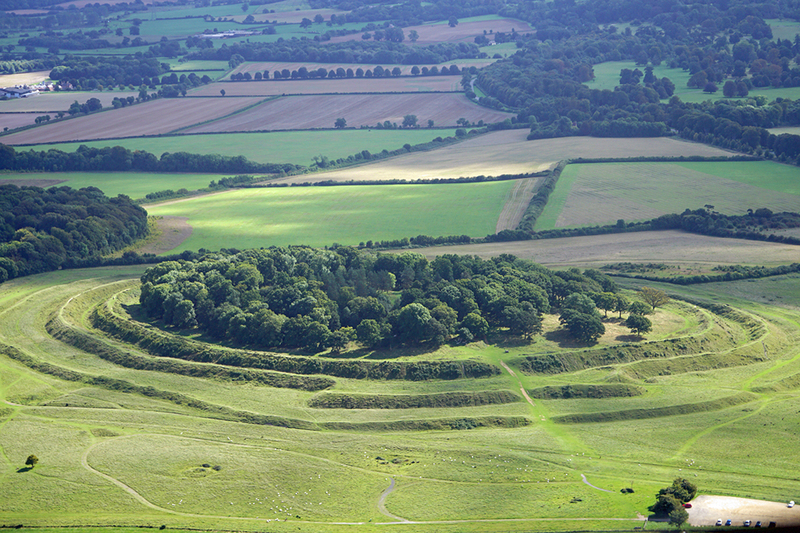 Badbury Rings (image 01), situated on a prominent chalk knoll in the parish of Shapwick, is a multivallate hillfort of roughly circular form enclosing roughly 7.3 hectares (image 02). It lies just north of the modern B3082 about 5km north-west of Wimborne Minster and dominates the immediate landscape, having excellent views in all directions. It forms part of the Kingston Lacy estate, bequeathed to the National Trust in 1992, whose volunteers have helped to clear and maintain the monument. The geology of the site is Reading bed gravel and clay overlying chalk. The ramparts have today been cleared of trees but the interior remains wooded, albeit thinly enough that an undergrowth of brambles and scrub thrives during the summer. In the early 1980s the summit of the hill was replanted with conifers to recreate the 18th century plantation feature known as ‘the Badbury Clump’. The Royal Commission for Historic Monuments (England) have surveyed the ramparts and the interior. 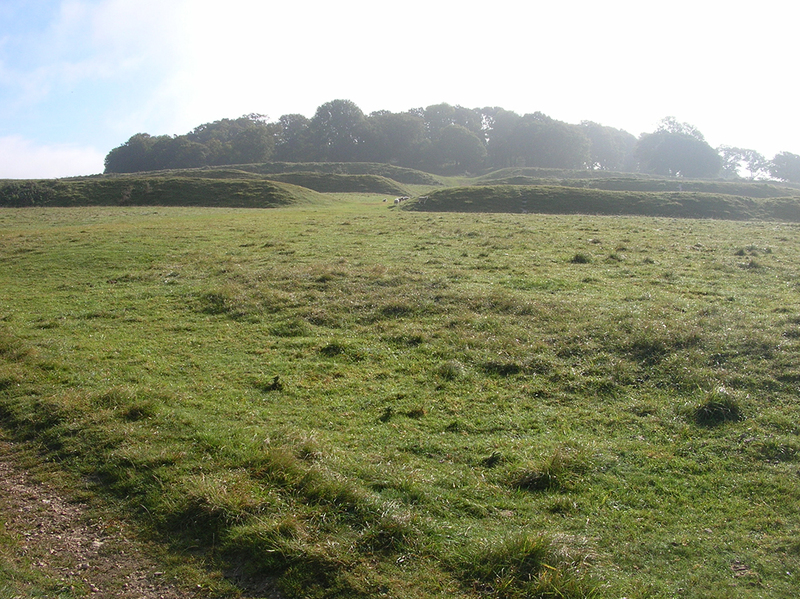 01 – Badbury Rings hillfort, Dorset. 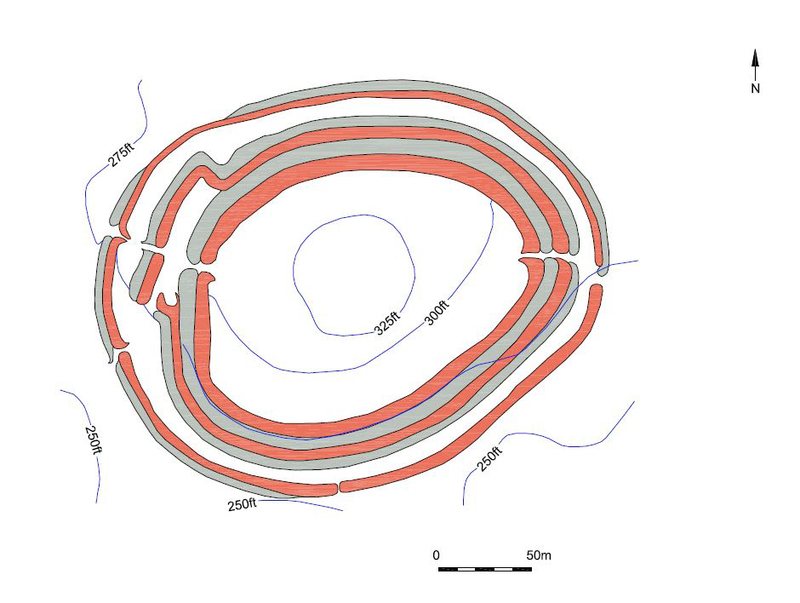 02 – Badbury Rings hillfort, plan. 03 – Badbury Rings hillfort, entrance. There are three clear breaks within the triple circuit of bank and ditch but only two represent the original points of entrance, the wide breach in the northwestern quadrant possibly being of modern origin (image 03). The outermost rampart is the least impressive of the three earthwork circuits and may be out of phase with the innermost two. The fort lies between, and at the junction of, two Roman roads, the Dorchester to Old Sarum and Hamworthy to Bath routes, and has been mooted as the site of Vindocladia, attested by the Roman geographer Ptolemy in the second century AD, although this name may perhaps refer to the Roman settlement at Shapwick 1km to the south. Earlier occupation is attested by the presence of three Bronze Age round barrows visible beside the access road, surface evidence suggesting that all have at some time been archaeologically investigated. Sharing the hill to the immediate east is another enclosure at High Wood. This appears to be contemporary with the hillfort but the surrounding ditch lies inside the bank and is judged to be a possible stock enclosure. The most striking features on the magnetometry plot are a number of ferrous anomalies near the summit of the hill. These almost certainly relate to the radio beacon and other military activity attested upon the hill top during the Second World War. The four main fixing points (M) for the 1942 radio mast are iron rings set securely into concrete blocks. Together these form a square 25m wide with secondary fixings (S) bisecting each side. Five linear anomalies (L) fan out in a star shape from the summit. These were initially thought to represent cable trenches relating to the beacon, but the strong ferrous nature of the response would suggest perhaps that the copper cable would was lain within an iron pipe. An alternative interpretation would be that the remains of wire fencing, overgrown and buried following the replanting of the clump. Two of the linear features recorded appear to terminate in strong ferrous anomalies (X), and none appear to extend beyond the area of the clump, which can be seen as a faint circular mark on the plot. Between the edge of the clump and the escarpment there are few strong anomalies. Some weak linears (W) can be seen and other anomalies that may relate to surface features. Several possible pits or hearths (P) can be seen and four magnetic scatters (F), probably representing strong burning or a spread of ferrous debris. These features could relate to ancient activity or buried rubbish from 20th century wartime occupation. Small magnetic spikes here and across the hillfort represent ferrous objects in the topsoil and, given the level of open access to the site, most probably relate to modern littering. 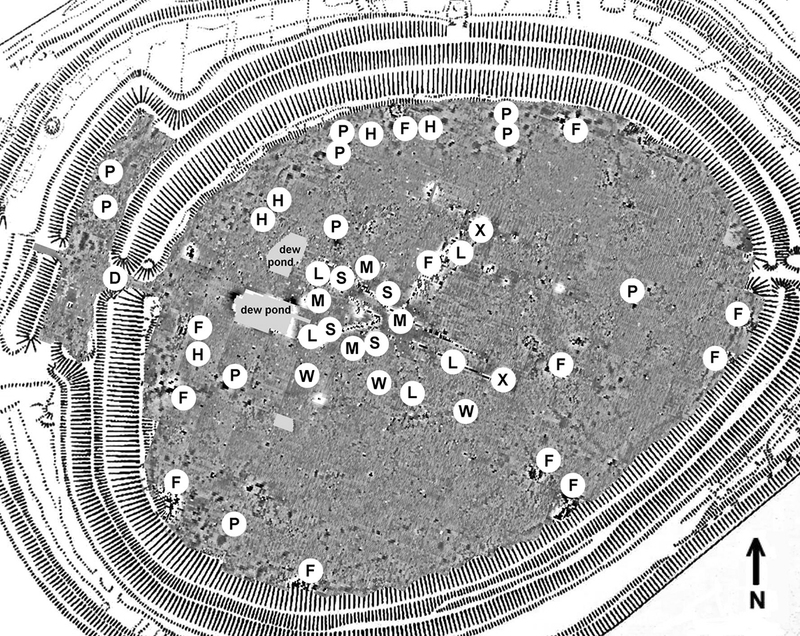 Beyond the escarpment, in the area between that and the ramparts, the number of possible pits or hearths (P) increases dramatically, with several appearing in pairs around the northern edge. Many of these features appear to be set within circular anomalies, broadly consistent with the working floor of hut platforms. Some of these are quite faint but others (H) show evidence of a surrounding gully and can unequivocally be interpreted as round houses. The magnetic scatters (F) are concentrated in the lee of the ramparts, an ideal location for industrial activity. The area of the barbican at the western extremity of the survey showed some activity but it is insufficiently diagnostic to specify a specific cause. Where the western entrance crosses the line of the inner rampart the plot shows high readings (D) indicating that the ditch used to be continuous and was subsequently infilled in order to create the causeway. An earth resistivity survey was carried out, taken at 0.5m intervals along traverses one metre apart. 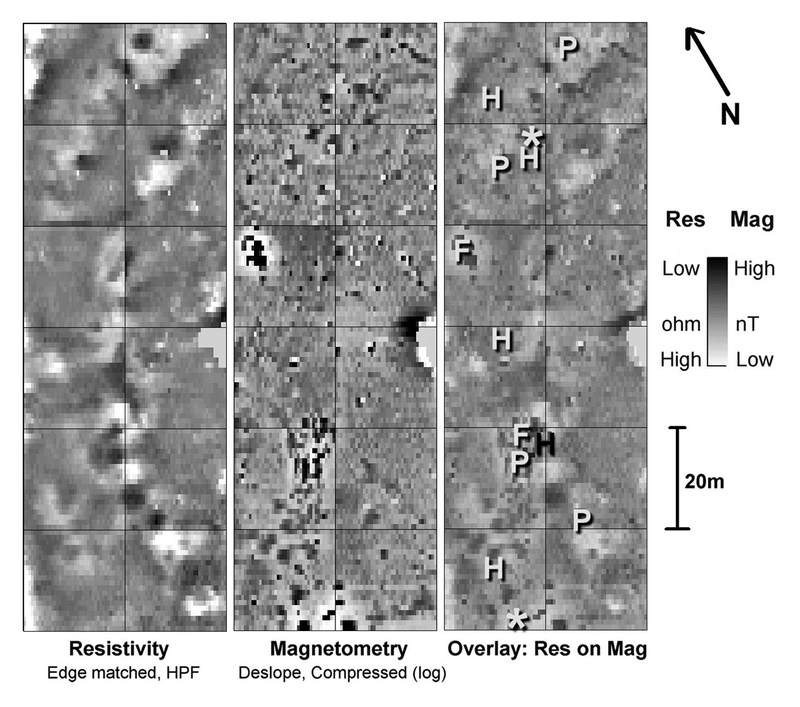 The resulting resistivity plot (image 07) provides good supporting evidence for the magnetometry. Pits (P) will show up on both instruments whereas burnt areas such as hearths, do not affect earth resistivity. Thus it would appear likely that both hearths and pits are present. There are two features represented by magnetic scatters (F) in this area. Resistivity shows that one is overlying a pit and is inside a house platform (black H), neither of which was apparent from magnetometry. 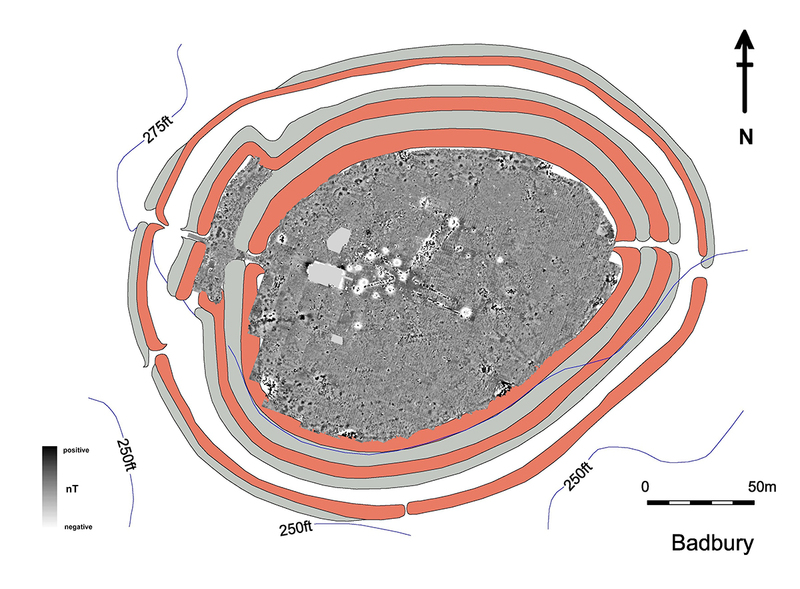 Resistivity is the best tool for locating built structures and the patch of high resistivity that is evident at the south of the hut platform may represent a slab or cobbled entrance to the hut platform. Four more house platforms (H) can be recognised with some certainty and there are a number of other possible candidates. Again, the small areas of high resistivity that are clearly shown on the plot may be associated with the entrance to structures. 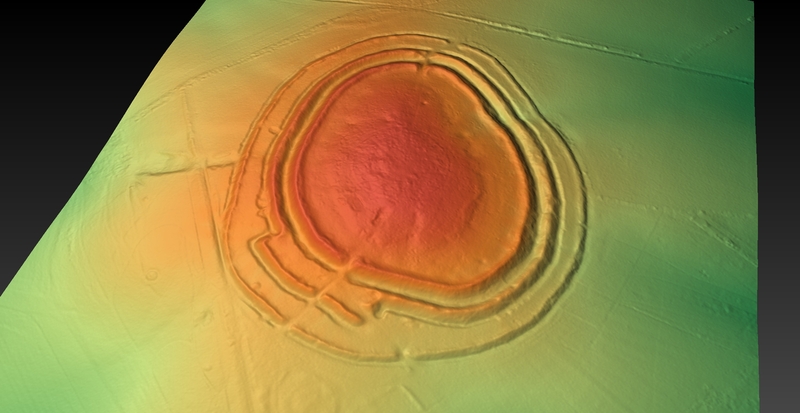 Wartime activity has probably obliterated all coherent traces of ancient activity at the centre of the hillfort, an area which potentially held the most prestigious of prehistoric structures. Certainly, the results of the geophysical surveys do not appear to identify any buildings that might relate to the flint artefacts found, nor of any later Iron Age or Roman structures, strong responses from the base of the beacon forming the most striking part of the World War II archaeology. 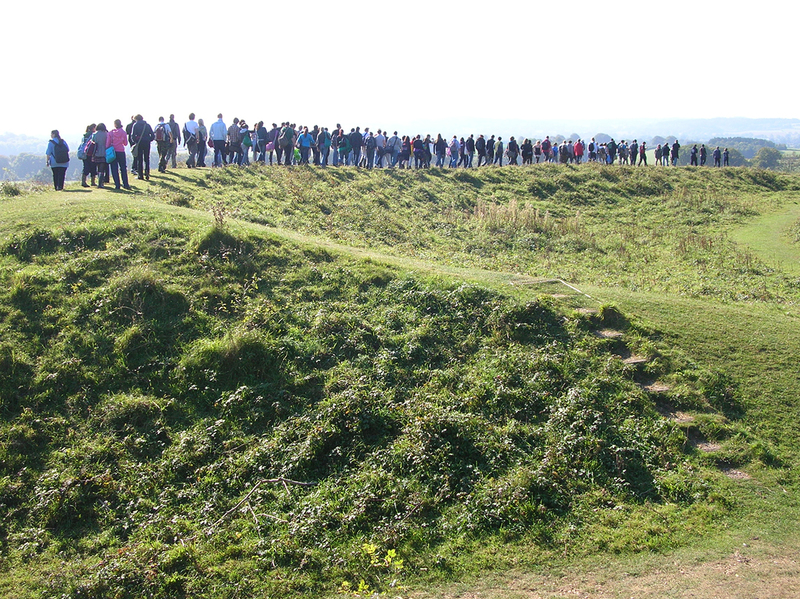 04 – Badbury Rings ramparts with group. if evident, appear only in the form of a few pits within the interior. The date of these pits is, of course, open to question. Surface features are visible as slight indentations but without corroboration, these could simply be tree-throw hollows. In the lower areas between the escarpment and the ramparts, however, there is considerable evidence of human activity. Penannular ditches, possible hut platforms and pits suggest an area of intensive Iron Age occupation with some industrial activity probably having been carried out in the shelter of the ramparts. Without extending the resistivity survey to cover all of this area, it is not possible to confirm how many of the recorded anomalies are pits or hearths nor how many lie within hut platforms. Neither, given the lack of comparable information from the interior, can one ascertain whether there was a spatial pattern to such activity. The evidence that the ditch of the inner rampart was backfilled confirms that this entrance to the barbican post-dates the original enclosure design. 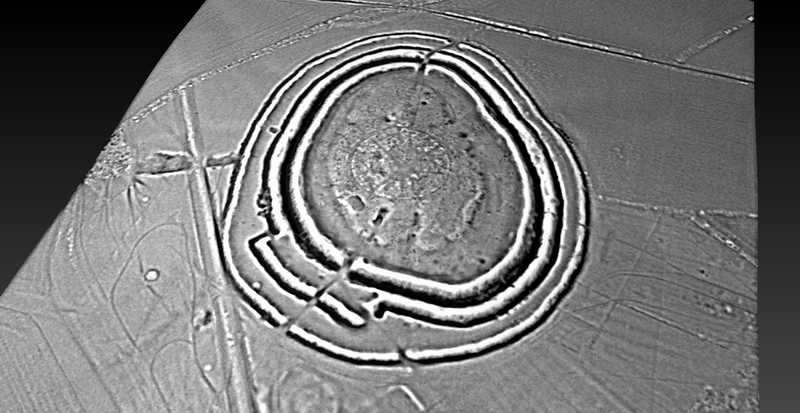 In conclusion, the survey has shown that more features remain in the interior of Badbury Rings than might have been expected from the extreme history of its recent use. It has not been possible to identify or comment on zonation in the ancient activity but the knowledge and understanding of the remains in the outer portion have been substantially increased. Useful future work might include examination of a hut platform and a magnetic scatter to identify what sort of activities were carried out. Sediment from the dew ponds might furthermore reveal more detail of the environment and the general date of their use.